Infrared thermometers are great for measuring temperatures, and since they don’t require physical contact with the object that is being measured, they’re preferred over the alternatives. Most people don’t realize that every object produces some amount of infrared energy, and a hot object produces more than enough energy to get an accurate reading. Consumers frequently use infrared thermometers to measure the temperature of household objects, but they’re also useful for medical purposes. A typical infrared measurement device uses a processing unit and optical detector, and once the optical system gathers the infrared energy emitted from an object, it sends it to the processing unit. The technology behind these products was originally developed to measure the temperature of pottery kilns, but today, it’s used in the industrial, engineering and manufacturing industries. 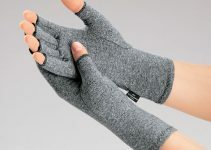 Consumers prefer infrared thermometers for measuring the temperature of objects that are impossible to physically touch, and they’re ideal for applications where access to the heat source is incredibly limited. Some objects are surrounded by high voltage or contain hazardous material, and an infrared thermometer is the only device that can safely and accurately measure the object’s temperature. In most cases, these products are easy to use, and with the press of a button, you can obtain an accurate temperature reading. Below, you’ll find 10 of the top infrared thermometers available. Some of the products are ideal for household, industrial and engineering applications, but you’ll also find a few great products for medical purposes. The Klein Tools IR5 offers an optical resolution of 12:1, which is the distance that it can be used for. With dual laser targeting, it delivers temperature readings that are more accurate than what you’d get from a single laser. The Klein Tools IR5 comes with an auto-scan feature, alarm and backlit display. It even powers off when it’s not in use. It has drop protection that is good for 6.6 feet, and it can measure temperatures between -22 and 752 degrees Fahrenheit. 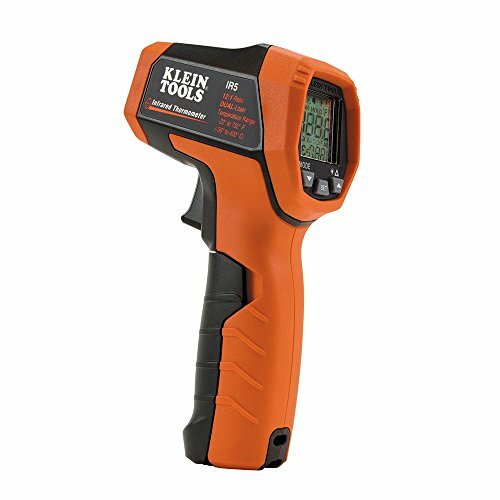 The Klein Tools IR5 gathers power from a single nine-volt battery, and during continuous use, the life expectancy of the battery is about 10 hours. This product is ideal for professional applications, and with such a wide measurement range, it can be used to measure the temperature of most objects. Here we have another product that uses two laser beams, and with two beams, it provides greater accuracy than many alterative products. 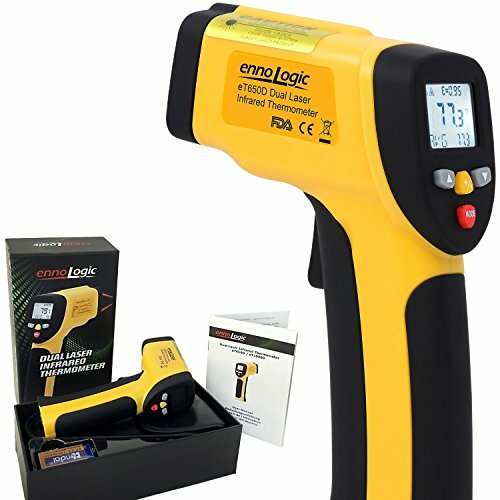 The ENNOLOGIC infrared thermometer can take accurate readings for hot food stations, BBQ, freezers, HVAC work, home improvement and cooking. However, this product is not made for medical use. The incredible accuracy of this tool makes it great for checking the temperature of brick or wood-fired pizza ovens, and it can even be used to check the temperature of a Himalayan salt block. The ENNOLOGIC thermometer is frequently used for car repairs because it’s great for discovering missing insulation and unwanted leaks. This tool can check the output of air conditioning units and measure heat loss around doorways and windows. The ENNOLOGIC thermometer can measure temperatures between -58 and 1,202 degrees Fahrenheit, and it has a response time of only 500 milliseconds. The RIVERSONG IR infrared thermometer can measure temperatures between -58 and 716 degrees Fahrenheit, and it’s one of the most-affordable products available. With a wide temperature range, it’s great for home repairs, auto maintenance and cooking, and the built-in laser makes it easy to precisely measure the temperature of any space. The RIVERSONG IR thermometer has a 12:1 distance-to-spot ratio, which makes it ideal for measuring targets at a distance. Many competing products must be used at close range, and they have trouble getting an accurate reading from a distance. This product has an auto-shutoff feature, and the LCD screen features bright backlighting. The automatic shutoff preserves battery life, and an indicator light lets you know when the battery is low. 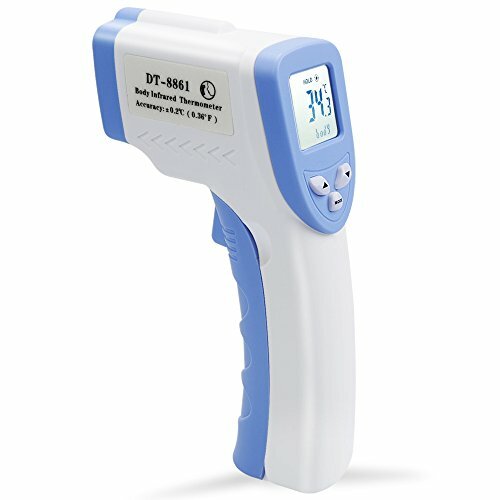 Before purchasing this infrared thermometer, you should know that it’s designed for inanimate objects, and it won’t give you accurate readings for animals or humans. The LP infrared thermometer has a temperature range between -58 and 1,022 degrees Fahrenheit, and it can also display readings in Celsius. For increased accuracy, it has a built-in laser, and the basic design makes it easy to operate. 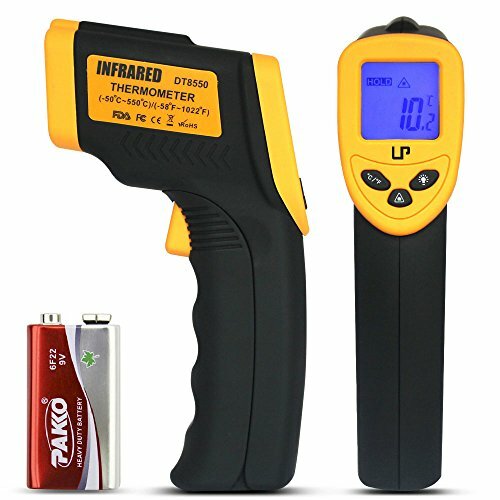 The LP infrared thermometer works with one 9V battery, which is included with your purchase. To preserve battery life, it has an auto-shutoff feature, and the backlit display makes it easy to see the temperature readings. This tool takes an instant to measure surface temperatures, and you don’t have to spend any time getting it set up. With laser guidance, it’s easy to see if you’re scanning the correct spot, and the LP infrared thermometer works for indoor and outdoor applications. You can use it to measure oven temperatures or electronic components, and since it can measure temperatures up to 1,022 degrees Fahrenheit, it useful for a wide range of applications. The Fluke 62 MAX IR is another top product, and since it doesn’t require physical contact with objects, it’s great for measuring at a distance. This product is frequently used for automotive, HVAC, mechanical and electrical purposes, and it can measure temperatures between -20 and 932 degrees Fahrenheit. The accuracy of every reading is within 1.5 degrees, and the distance-to-spot ratio is 10:1. The Fluke 62 can display the difference between two temperatures, and it’s IP54 certified for protection against splashing liquids and dust. A small, lightweight design makes this tool easy to clip onto a tool belt, and during testing, it has been dropped from three meters. 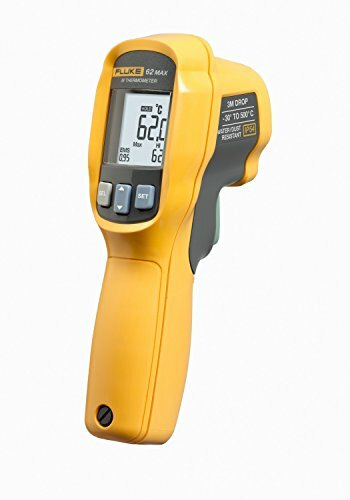 The large, backlit display makes the temperature data easier to read, and the Fluke 62 MAX IR is comfortable to hold because it’s designed for ergonomics. 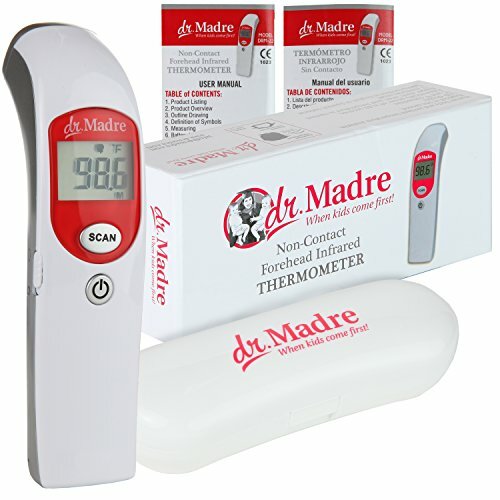 The Dr. Madre medical infrared thermometer can take a temperature reading within one second, and it takes the difficulty out of reading body temperatures. With the quick-scan feature, you can get your child’s temperature quickly, and the accuracy of the reading is high. The Dr. Madre thermometer is especially useful for continuously monitoring your child’s fever, and although it’s great for sleeping newborns, it works just as well for kids who can’t sit still. If you’re looking for a way to monitor your child’s temperature and don’t want to interrupt their normal activity, then this thermometer is worth considering. Since it talks to you, the Dr. Madre infrared thermometer can give you data readings in an audible format, and you don’t even have to look at the device. For accurate measurements, this tool must be used two to four inches away from the surface of your child’s skin. 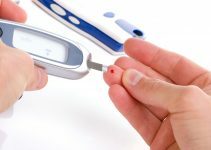 The SinoPie digital thermometer can measure the temperature of a human body, but it’s also great for checking the temperature of other objects. It’s commonly used to check food and milk, and since it doesn’t need to physically touch the object, it’s great for measuring temperatures from two inches away. Many parents use this device to check their baby’s temperature because it doesn’t disturb children while they’re sleeping. 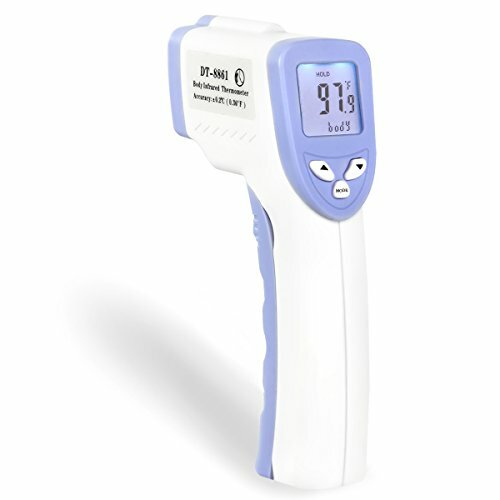 The SinoPie infrared thermometer can store the last 32 measurements taken within its internal memory bank, and it makes tracking temperature changes much easier. It only takes 0.5 seconds to get a measurement, and the readings are accurate within 0.4 degrees Fahrenheit. There aren’t too many other tools that make it easier to take the temperature of a fussy child. Depending on your preferences, you can view the data in Fahrenheit or Celsius, and you can even set an alarm temperature. Here we have a popular product from Hylogy, and it can be used to measure the temperature of a person or food. With two practical modes, it’s useful for many applications, and it’s commonly used in medical settings. This thermometer works well for food preparation, childcare, schools and vets, and since the backlighting uses three different colors, it doesn’t take long to read and comprehend the data. When this device measures a normal body temperature, the backlighting turns green. If the person has a slight fever, the backlighting will turn yellow, and for a high fever, it will turn red. The Hylogy digital thermometer has a measuring range between one and three centimeters, and it can be used on children or adults. The QPAU thermometer has a measurement range between two to 5.9 inches, and it’s commonly used to measure the temperature of BBQ, bath water, children, adults, babies, milk and wine. It has an auto-shutoff feature that preserves battery life, and it’s designed for minimal energy consumption. This device takes only 0.5 seconds to get an accurate reading, and the accuracy of the data should be within 0.4 degrees Fahrenheit. With a large memory, it can store the last 32 measurements, and the data can be set to display in Celsius or Fahrenheit. 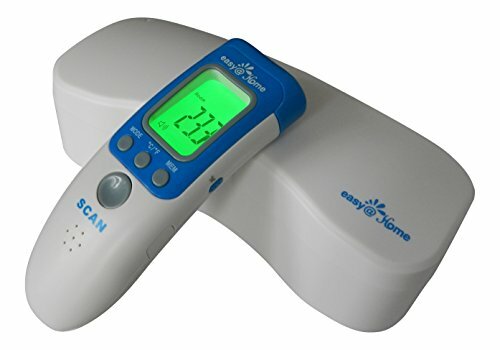 The Easy@Home 3-in-1 thermometer uses infrared technology to obtain an accurate temperature reading, and unlike industrial products, it’s specifically designed for human use. The device must be held between about two inches away from the center of the subject’s forehead, and by detecting the amount of infrared energy emitted by the subject, it will display an accurate temperature reading on the screen. This device is FDA approved and recommended by pediatricians. The backlit display uses three different colors to give you an approximate range, and to avoid disturbing a sleeping infant, it has a silent button.